CATAGO® Body Shield is almost like an extra layer of skin. Ideal for the newly clipped horse in order to avoid abrasion of the coat behind the girth during riding. In a lightweight, soft, elastic and hard-wearing material that is easily secured with Velcro® straps. The bandage works as a preventive measure, as well as for when abrasion has occurred. 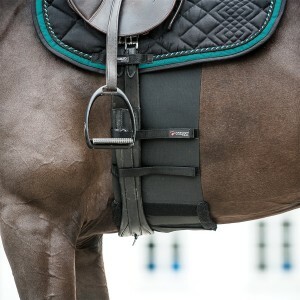 Used to protect the horse from spurs or for horses that are very sensitive to the rider's touch of the leg.